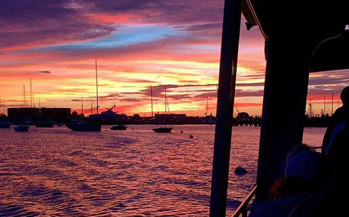 Gansett Cruises offers one and a half hour narrated harbor boat tours and sunset cruises on Narragansett Bay. 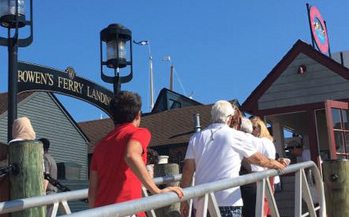 Cruise in comfort as you enjoy a scenic tour of Newport and Jamestown. Complimentary Rhode Island specialty and cash bar with a selection of wine, beer, and signature cocktails. 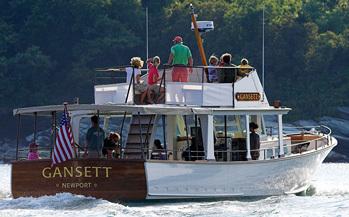 This summer Gansett Cruises is celebrating 10 years on the water! 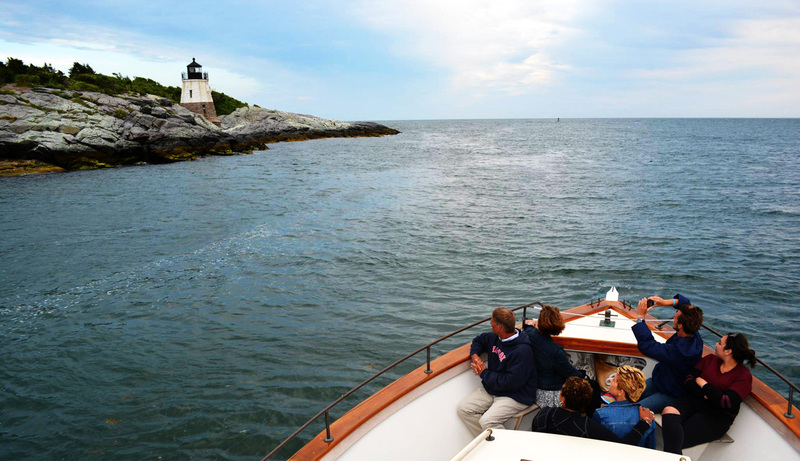 Gansett Cruises breaks away from the typical rushed harbor boat tour to offer a quiet relaxing and delightful cruise of Newport Harbor and Narragansett Bay’s East Passage. Our guides, are enthused to share the legends and rich history of their homeport. It’s just the feeling you get from being on a well-appointed private yacht that makes M/V Gansett so special. The open deck plan, comfortably cushioned seating and broad sun canopy create a pleasant cruising experience. Come cruise with us today! Blown away on this terrific boat cruise. Highly recommend John our fantastic and funny tour guide. He was most informative. Best cruise tour we ever had. Book the cruise and be sure to ask for John. We have been on a lot of harbor cruises in New England, the US and abroad. This was one of our best experiences. Talented narrator Christopher was just the right personality to teach and entertain and make it a fun ride without going overboard…so to speak! Beautiful well maintained boat with ample comfortable seating! Easy on and off. Marvelous cocktails made fresh to order with RI specialties was a very nice touch. The servers were very professional and pleasant. Best part…a magnificent 90 minutes ride in a gorgeous harbor! Love, love, loved this cruise. Johnny & Alicia we’re our crew and they were fantastic!!! Johnny came out and asked where everyone was from & engaged the crowd before we even got on the boat. He provided great historical details and was lively & engaging. A complimentary drink is provided which was served by Alicia with a smile. I loved it so much, I’d do it again when we come back. Every Gansett cruise offers select complimentary refreshments with a unique Rhode Island flair, including Del’s Frozen Lemonade, Delicious Coffee “Cabinet” milkshakes, RI State Clam Quahog “Stuffies”, Champagne Toasts, and more – All compliments of the Captain! Gansett also features a cash bar serving a selection of locally brewed beers, regional wines, signature cocktails and soft-drinks. Ask your server about today’s available specials! *For your safety please wear soft soled shoes. No heels! Also, no strollers or wheelchairs allowed on board for safety reasons. Thank you. Pet friendly — dogs on leashes welcome.